Food mixers play an important role in most commercial kitchens. A food mixer is a versatile piece of equipment that can take care of a variety of tasks, from whisking light mixtures for frostings and meringues to beating cake and cookie batters to kneading heavy doughs for pizzas and artisan breads. A mixer doesn’t only save you time and effort by handling the heavy mixing for you; it also ensures you are using thoroughly mixed ingredients for creating high-quality food products. 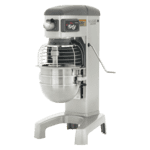 When looking for a new food mixer to add to your commercial kitchen or replace an old model, you need to make sure your choice satisfies your specific needs and preferences. 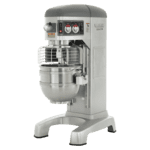 In this mixer buying guide, we share with you the different types of commercial mixers, the features you need to look for, and some tips for finding a mixer that suits your requirements. Planetary mixers are the most common type of food mixers. They have an agitator, typically a whisk, a beater, and a dough hook, that is attached to a shaft. The agitator rotates as it moves around the inside of a stationary mixing bowl. The movement is similar to how the planets of the solar system rotate on their axis as they revolve around the sun, hence the name. Planetary mixers are also sometimes called vertical mixers. Among the types of mixers, planetary mixers are the most versatile. This stems from their ability to include different attachments that let the equipment whip, cream, or beat mixtures with adequate moisture content. Some models also come with a power takeoff hub. This lets you include attachments to perform a wide variety of food preparation tasks, such as shredding vegetables, grinding meat, or rolling pasta. Dough mixers are also called spiral mixers because of their spiral-shaped agitator. This stays in place while a mixing bowl moves around the agitator, which distributes heavier mixtures more evenly around the bowl. 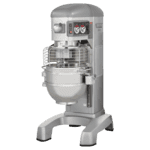 For this reason, dough mixers are used solely for pizza doughs and bread doughs, which are denser and heavier than regular pastry batters. Unlike planetary mixers, dough mixers do not come with multiple agitator attachments, but they are extremely good at what they do. Foodservice establishments that aim to provide high product volumes at quick rates look to vertical cutter mixers to fulfill their needs. This type of food mixer is characterized by a covered mixing bowl and an interior agitator attached to the bottom of the bowl. 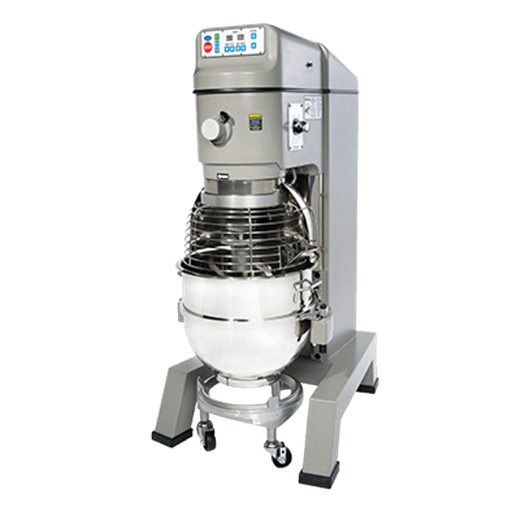 Vertical cutter mixers can carry an array of mixing tasks, such as chopping nuts, cooked meats, and salad greens as well as mixing batters and doughs. However, most models do not provide the same level of performance as planetary and dough mixers. The size of the mixer determines how much you can process and where to place the equipment in your kitchen. Smaller mixers with a capacity of less than 10 quarts are countertop models. The size of the mixing bowl also matters. A mixing bowl that is too small runs the risk of overfilling, which can lead to mixtures that are not mixed thoroughly. 10-quart mixers can typically handle 4 to 5 lbs. of dough and 6 to 8 lbs. of batter. These small mixers cannot process too much dough for long periods of time because they have smaller motors, typically with ½ horsepower. For medium applications, stand models and some floor models have a larger capacity of 20 to 30 quarts. These typically have 1 to 3 horsepower motors that can generate more power to handle higher volumes. These mixers can usually process 15 to 45 lbs. of dough and 4 to 6 quarts of whipped cream. Larger operations have the option to use mixers with a capacity of 60 quarts and above. The largest food mixers are floor mixers with a capacity of 140 quarts. These have very powerful motors that allow them to process high product volumes for long periods of time. Typically, large mixers can accommodate up to 70 lbs. to 90 lbs. of dough, 60 lbs. to 100 lbs. of batter, and 12 to 30 quarts of whipped cream. Drive systems are either belt-driven or gear-driven. Mixers with a belt drive system provide the ability to adjust the speed settings without shutting down the mixer first. However, they usually wear out more quickly and require more frequent maintenance checks and repairs. Belt-driven mixers also have a reputation for having “belt slip,” which is caused by insufficient grip between the drive and the belt. Gear drive systems, on the other hand, do not have the problem of belt slip, making them more powerful and longer-lasting than belt-driven systems. Because they are more reliable, they do not need to be fixed as often as belt drive mixers. However, when they do, repairs are typically more expensive. Gear drive systems also tend to be noisier than belt-driven mixers. Mixers offer different speed settings. Basic models can provide up to three speeds, while high-end mixers can have as many as 12 settings to provide extreme precision and control. Some mixers have a slow-start speed setting, which allows you to add dry ingredients such as flour and sugar without creating a mess. Other models offer a fold setting, which gently mixes flour into the batter without removing air out of it. Some of the higher-end models have a variable frequency drive, which lets you change the speed of the mixer on the fly without needing to shut the mixer off. This lets you maintain the right mixing speed even when you increase or decrease the load. They also come with built-in overload protection, which automatically turns the mixer off in case of overfilling. Larger mixers have a higher horsepower than smaller models because they process more ingredients at a time. A 5-quart countertop mixer typically uses a 1/6 horsepower motor, while a 60-quart floor mixer may run on a 3 horsepower motor. This makes the latter more suitable for thick, dense doughs, which require more power to be mixed thoroughly than lighter batters. Large mixers that can handle 10 lbs. or more usually include a bowl lift that can be operated manually or electronically. You don’t have to do any heavy lifting because the bowl lift does all the work for you. A mixer with a bowl lift has arms that attach to the sides of the mixing bowl. The arms raise the bowl to the agitator and lower it when mixing is done. Some bowl lifts also swing out to the side to make adding or removing ingredients easier. Some manufacturers turn their bowl lifts into a safety feature. If the mixing bowl is not properly raised to the right position, the mixer will not turn on. A manual bowl lift typically uses a wheel or a lever that can be turned or pulled to raise or lower the bowl. Electronic lifts can usually be operated with a single push of a button. Some models that can accommodate larger amounts of ingredients also come with a bowl trolley, which is used to transport the heavy bowl around the kitchen. 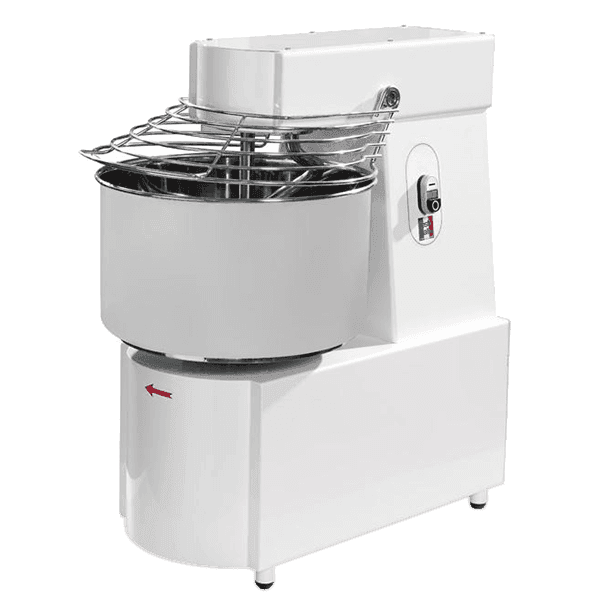 Premium mixers may also include a power lift that can raise the mixing bowl to tabletop height and tilt the bowl so you can dump the ingredients onto the work table. A food mixer has plenty of moving parts, which means there’s a lot of room for accidents if the machine isn’t handled properly. To prevent untoward incidents from happening in your kitchen, manufacturers have incorporated plenty of features that help make using their products safer. Most mixers have a bowl guard, which is usually made of stainless steel wire or heavy-duty transparent plastic. This keeps fingers, clothes, utensils, and other items from falling into the mixture and getting trapped there while the mixer is running. Some mixers are also equipped with a no voltage release coil, which trips the motor so that it doesn’t automatically start after a power supply cutoff. Some models have bowl support interlock, which helps keep heavy mixing bowls stationary while the agitator is moving. Most mixers also have neoprene or rubber foot pads that stabilize the unit and keep it firmly in place. Flat Beater: This is the go-to attachment for making cake batters, cookie doughs, mashed potatoes, and all sorts of light to medium mixtures. It can also be used to add solids, such as nuts, dried fruits, and chocolate chips, into the batter. Wire Whip: Also called balloon whip or a cage whip, this is used for incorporating air into eggs, egg whites, and creams and turning them into meringues, frostings, and whipped creams at high speeds. Dough Hook: This is a C-shaped, J-shaped, or spiral-shaped attachment best used at low speeds for working ingredients in heavy doughs. Spiral-shaped doughs are more common, but C-shaped and J-shaped attachments are sometimes preferred because their shape allows them to add the ingredients more gently than spiral-shaped hooks. Pastry Knife:This is used for blending butter, shortening, and other fats into flour for making flaky pastry and pie crusts. The pastry knife is best used at low speeds to keep it from overworking the gluten. Wing Whip: This is similar to a wire whip but has sturdier frames that allow it to aerate heavier mixtures, such as mayonnaise and mashed potatoes. 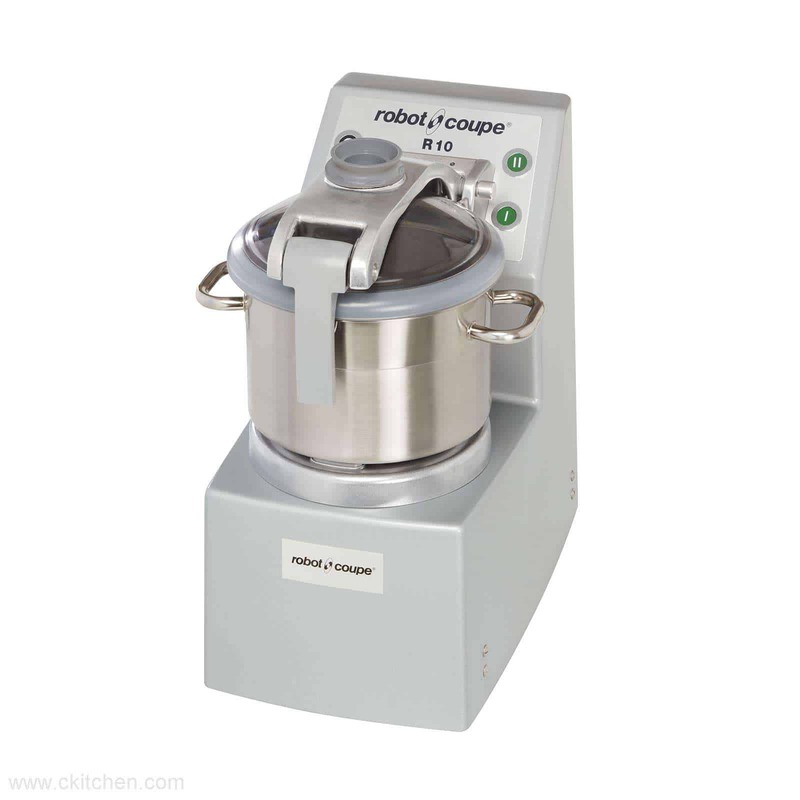 Most high-end models also have attachment hubs that allow them to perform tasks beyond the usual mixing, beating, and kneading. These attachments let you include a meat grinder, sausage stuffer, vegetable shredder, strainer, grain mill, juicer, pasta roller, and ravioli maker, among other things. Manufacturers design their mixers to be convenient to use. Some features you may want to look for include bowl scrapers. Bowl scrapers are typically made of plastic, nylon, or rubber. They are attached to a permanent mounting bracket on the agitator shaft and move around the bowl to scrape ingredients off the sides as the mixer is running. This saves a great deal of time and effort since you don’t have to turn the mixer off to do some manual scraping before you turn it on again. Some mixers also have an ingredient chute that can be attached to the bowl guard. This lets you add ingredients into the mixture while the mixer is running. A built-in timer is also useful. You can set an alarm for when the mixing is done so you can walk away from the mixer to work on other tasks and come back when the mixer sounds the alarm. 1. Figure out what you need it for. What mixtures do you need to prepare? For restaurants that need to make small batches of batter, a standard-duty mixer for occasional use may be adequate. However, for larger establishments that need to make bulk batches of pastries, pizzas, and other baked items, heavy-duty models are a must. Still, not every heavy-duty model will be right for the job. To make sure you choose a mixer that can accommodate your needs, figure out the absorption ratio of your mixtures and ask the manufacturers which of their models are most appropriate for your needs. The absorption ratio can be determined by dividing the amount of water content by the amount of flour in your mixture. A lower absorption ratio means your mixture has less moisture content and is, therefore, more difficult to mix. Pizza doughs, for instance, have lower absorption ratios and need to be mixed in a unit with a more powerful motor. 2. Determine how much mixing you will need to do. How much will you need to prepare? If you’re a small restaurant, you may need to invest in a small planetary mixer with a capacity of 5 to 20 quarts. Larger operations, such as pizza chains or bakeries that need to prepare high volumes of ingredients, require larger mixers that can accommodate 40 quarts and up. Certain factors can also affect how much you can mix at a time. For instance, a mixture that uses high-protein flours such as almond flour, soy flour, or chickpea flour, will need to be mixed in a smaller batch. Mixtures that use cold water, less water, and more fat also tend to be on the heavier side, which also means they need to be mixed in smaller batches.